Since its introduction to the world in 2003, Net Promoter Score (NPS) has become an increasingly popular tool for improving return on investment. By measuring how likely a customer is to recommend your business to others, NPS allows decision makers to assess the impact that their decisions have had on customer satisfaction. Simultaneously, it allows them to see how many customers are actively promoting the business. The Net Promoter Score ranges between -100 and +100. To calculate NPS, it is necessary to ask customers to rate the likelihood of them recommending your business to others on a scale of 0 to 10. Those who respond with a score of 9 or 10 are considered to be promoters. People who answer 7 or 8 are passive. Those who answer 0-6 are considered to be detractors. 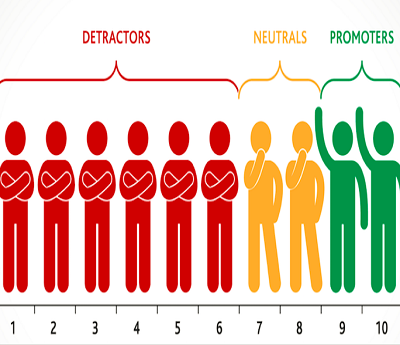 The NPS is equivalent to the percentage of promoters minus the percentage of detractors. A score that is positive is considered to be good, whereas anything over +50 is considered excellent. In order to effectively use NPS to improve your products or the way in which they are marketed, it is necessary to gather information about what your promoters like about them and what your detractors dislike. In this way, decision makers can gain an understanding of which aspects of their products or services are valued by promoters and should therefore be emphasised in marketing materials. By listening to the voice of the customer you can rapidly get a picture of the aspects of service that are unsatisfactory. You can then quickly respond and address these concerns in order to switch detractors over to being promoters. Effectively, the promoters that are identified by your survey are an extension of your company’s marketing department. By engaging with detractors and taking actions that are designed to push them towards being promoters you will maximise the word of mouth marketing that your product or service receives. By focusing on increasing NPS a business can increase traditional measures of marketing effectiveness like cost per acquisition and customer lifetime value. 3. A product or service that is successful in generating promoters among its current customer base will also be more likely to appeal to new customers. This means that by focussing on NPS a business can help to improve its ability to retain the customers it attracts. One of Bright’s Telecom clients proved last year that their “Promoter” customers spent 33% more. A very compelling business case when on average clients NPS scores increase by 20% after integrating a self-correcting voice of customer solution. A typical example is shown in the graph where teams both achieved this improvement as well as reducing the spread between the teams’ performance over an eight-month implementation period. 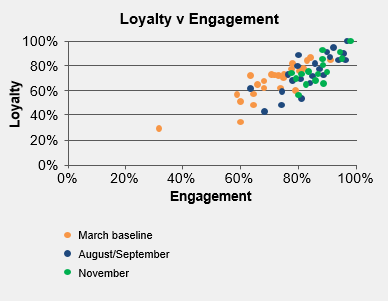 Staff engagement (as scored by customers), was one of the key drivers. To summarise, if a company adopts NPS as a key measure of performance, and sufficient resources are allocated to help gather the necessary information and respond to the findings, then it can ultimately make a huge impact on profitability.